Sometimes app does work, but kinda makes me wish for something more smooth. I tell myself that there are better apps out there and that I will switch some time in the future. Few months into future truth sets in that this is the match and I am stuck with it. LogLady is such kind of an app. It isn’t fancy or snappy but it is there for me when it really matters and that is what logs viewer application should be about. App opens text file (or multiply files combined) and allows to filter out lines that do not much text you search for. Simple yet exceptionally useful and somehow rarely encountered function. Aside from core filtering function it is very handy to open multiply files at once. 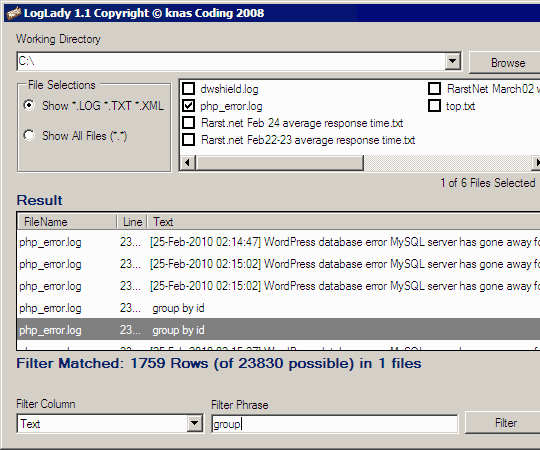 It saves time jumping between different related logs and combined results can also be exported nicely in single CSV. Performance is not exceptionally fast, but very reasonable and can handle quite large files. Still for very large ones (hundreds of megabytes) it is understandably memory-hungry. Here it is not about problems that are in, but features that are not. App could be so much better with some interface polish and more flexible search options. Exclusions? Regular expressions? Sadly nothing except straight text matches. Rough but it gets job done in simple and straightforward way. Who knows, maybe I will encounter app that does it better. But not so far. Nice find! I’ll be testing it. Oh and it’s completly portable too. Log viewers are ~so~ retro ! But LOVE the log icon you use. Glad you like it. :) Forgot to mention portable in post, thanks for reminding. As usual it is app’s icon. :) So compliments go to developer. Why retro by the way? Not like there is better way to view logs nowadays. associates it with old-time proggies, Archie, floppy drives, DOS. Thanks Rarst, I needed a tool like that today, and I remembered reading this here, so I found your post and downloaded LogLady.